ou probably know that Forbes ranked Utah as the "Best State for Business" for three years running. You may also have heard that USA Today anointed Utah the "Best-Managed State" in America. And maybe you noticed that the Milken Institute ranked Utah tops in "Technology Concentration and Dynamism." The easy answer is that Utah is extraordinarily well run. The Pew Center named Utah the "Best Managed State in the Nation," and with a projected budget surplus of some $400 million by FY 2014, Utah remains one of only seven states in America which still maintain a AAA credit rating. As Professor Ian Harvey of the University of Utah notes, "We have no choice. Utah is pretty small — we have to be smart to be competitive." The governorships of Jon Huntsman and Gary Herbert have been marked by lofty ambition, by promises to revitalize entrepreneurship, stimulate the private sector and create high-tech jobs. "Bah!" you say. Anyone who's ever watched a political stump speech knows that's merely par for the course, fodder for the political base. These sorts of promises are blithely tossed around in the other 49 states. No reason to get excited, right? In Utah they actually meant it. And actually did it. Utah is the third fastest growing U.S. state, and with an average age of 28.7, has the youngest work force in the nation. The collective smarts of that youthful, energetic labor force are being channeled into cutting-edge industries such as digital media, gaming and life sciences. Amazingly, the Utah state government is the same size today as in 2000, even though the state has added more than 600,000 new residents since then. And in a fit of anti-bureaucratic glee, to great applause from business leaders and economists alike, the state eliminated 368 regulations in 2012. Most historians agree that the 20th Century was the American Century, and some bandied about the notion that the 21st is likely to be the Chinese Century. Not so, according to the Chinese themselves. Delegates from a recent trade mission to Utah were awed by the state's business model, and claimed that it would take China 100 years to catch up. The delegation good-naturedly joked to Gov. Herbert that Utah's success gave them something to aim for, and would motivate them to find new ways to innovate. Few states could have won such envious praise from the Chinese. Few countries, for that matter. "It's the up-and-coming version of Silicon Valley. With better skiing." Most probably don't think of Utah as a center for young, hip innovators on the cutting edge of digital technology. Most would be wrong. Today, 41 percent of all digital media jobs in Utah are in the video gaming sector. As Utah's Cluster Acceleration Digital Media Report notes, "As the video game industry has changed, the skill set and the mix of talent required by industry professionals has also changed. For example, game development teams traditionally consisted of over 40 internal developers and relied heavily on outside contractors. Game development would cost in excess of $10 million per game and the development cycle would extend over a one- to three-year period. Character images are courtesy of Smart Bomb Interactive and the University of Utah Entertainment Arts and Engineering Program. Mesa Arch photo (Canyonlands National Park) is courtesy of the Utah Office of Tourism. "Today, games for smartphones or social media sites are developed by a small, flexible team of some five internal developers working with a budget of $250,000 and a completion deadline of three to six months. These teams must be made up of skilled individuals who are proficient in the latest technologies and have the ability to collaborate in small teams." Testimony to the vibrancy of Utah's business climate is the fact that it is second in the nation for inventor patents. Back that up with the state's outstanding quality of life and you can begin to understand why tech firms find Utah an alluring alternative to high-priced Silicon Valley. Many of those growing their technology firms in Utah affectionately refer to this region as "Silicon Slopes" and note that the high-tech world is perpetually stunned by the amount of talent coming out of Utah universities. At a recent Digital Media event in Park City, local business legend Thomas Mabey suggested that the secret was out, saying, "The rest of the world is catching on to the huge opportunities for venture capitalists in Utah's digital media industry!" Jeff Bunker of Avalanche Software, a Utah-based gaming software developer recently acquired by Disney Interactive, wouldn't dream of growing the business anywhere else. Says Bunker, "Utah has some fantastic university programs, particularly at BYU and University of Utah, that produce sought after, young, top-tier talent. It is a huge advantage for us that many of these graduates would prefer to stay in Utah, having grown up here or because they became enamored by the lifestyle while attending school here." Blackrock Microsystems, one of many bioengineering companies thriving in Utah, is developing a ground-breaking technology called Cereplex, potentially giving new life to those suffering life-crippling brain injuries. Recently profiled on "60 Minutes," this ground-breaking technology aims to restore a semblance of life to those once trapped inside their own skulls. Governor Gary Herbert addresses the next generation of innovators. Andy Gotshalk, CEO of Blackrock, notes, "Through our software and signal processing products neurologists can monitor and detect neural-related [disorders] like seizures, brain injuries and a host of other brain-related maladies. This capability is leading to advances in neurosurgery, brain-controlled prosthetics, and technologies that will ultimately save lives on the battlefield through remote monitoring, sensing and even neural therapy of wounded soldiers." Gotshalk goes on to explain, "Researchers are working on cognitive therapies that merge video and gaming with brain signal monitoring to more clearly understand the nature of disease- and disorder-related dysfunctions of the brain such as autism, schizophrenia and other illnesses. Blackrock Microsystems provides the sensing and processing tools to capture these brain signals." Brain-controlled prosthetics? Sounds like the stuff of fantasy. Which makes sense — it's all made possible by gaming. The symbiotic relationship between the life sciences industry and the gaming industry cannot be overstated, and highlights why Utah has made the separate industries of Life Sciences and Software & IT Development two of its core industry clusters. As Gotshalk explains, "Our technology opens up a new and exciting world of ‘neurogaming' where action thoughts of the gamer are replicated into actions of video game avatars bringing a whole new experience to video games." Media coverage and the seemingly non-stop barrage of TV advertising for "mature" video games would have us believe that they dominate the industry. In truth, these often-violent games account for only about 8 percent of the industry. The bulk of research and development goes into the sector accounting for as much as 40 percent of the gaming industry: games for children. These are teaching games that more often than not educate young people, showing them the world and helping them understand their place in it. It's one of the fastest growing industries in the world, and the same technology being developed today to fill their brains may in the future be used to repair them. Again and again we come back to the central question, though: Why? Why does Utah garner such accolades from national and international media? Why do world powers such as China look to Utah to learn best practices for growing their economy? Why does Utah's workforce enjoy the highest literacy rate in the U.S.? And why did Brookings call those same literate people the most productive work force in America in 2011? Just how does Utah play the economic development game so well? The Chinese were willing to fly more than 15 hours to try to discover the answers to those questions. Any American businessperson interested in some solid answers can be there in less than four hours. Come find out for yourself. This Investment Profile was prepared under the auspices of Utah – Governor's Office of Economic Development. For more information please contact Michael O'Malley at momalley@utah.gov or 801-538-8680. On the Web, go to http://business.utah.gov. Character image is courtesy of the University of Utah Entertainment Arts and Engineering Program. Salt Lake City photo is courtesy of the Utah Office of Tourism. 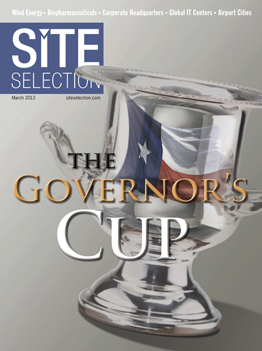 Adam Jones-Kelley serves as President of Conway and Publisher of Site Selection magazine, having been with the company for nearly 20 years. Adam is a featured speaker at events around the world and a regular contributor to Conway's various publications.